The Powerbilt Junior Box Sets are the perfect product for juniors. Each set features the set makeup that's right for their age group, complete with headcovers and stand bag. Available in multiple age groups for both boys and girls. Assembled Powerbilt Targetline putters feature cutting-edge designs at value prices. High contrast alignment system combined with white compound insert make this putter easy to line up but forgiving on mis-hits. 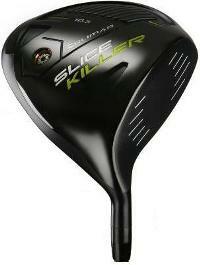 The Orlimar Slice Killer 460cc titanium driver will eliminate a slice in virtually any swing! Featuring an extreme 7° closed face, combined with an offset hosel means longer, higher, straighter drives for even the biggest slicers. In all black PVD finish and cutting edge modern design. Assembled 460cc driver comes with free headcover.